We need to start in Automator and build a new workflow. 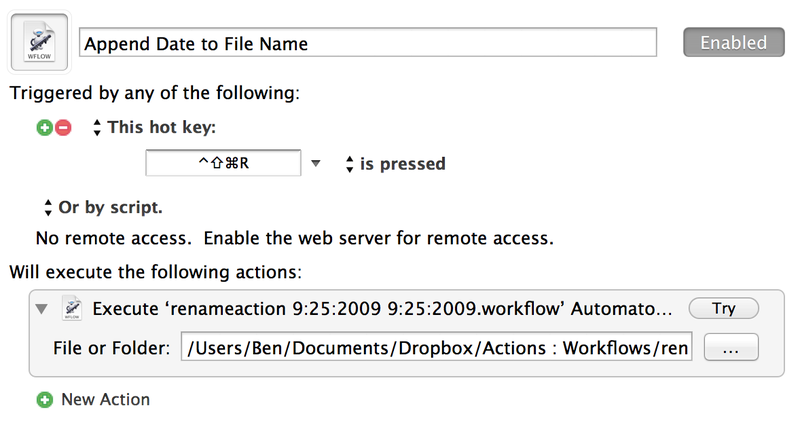 Open Automator and when prompted to create a new file select Workflow. In the search field to the left, search for the action named Get Selected Finder Items. Drag that to the pane on the right. This action will tell Automator that we are working with the files you have selected and only those files. Search for another action named Rename Finder Items and drag it to the right pane. When prompted to add an action to copy the file first select Don’t Add. 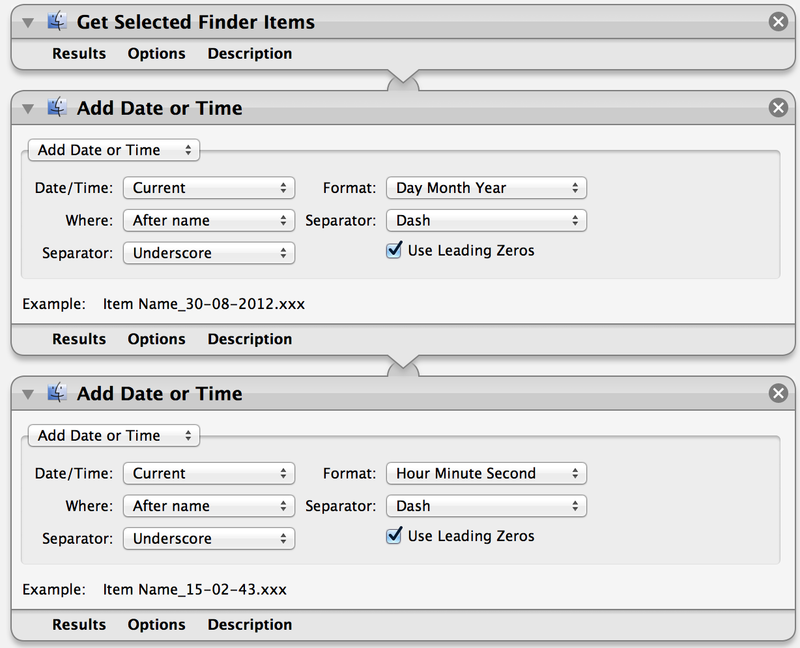 The final Automator action, that adds the date and the time. Be sure to use spaces, dashes, or underscores for the separators so that you don’t break non-Mac tools (other operating systems and websites hate the forward slashes). You have four options of the date to grab: Created, Modified, Last Opened, Current. All the options work as expected, but the first three may not always result in the date you intended it to, for that reason I stay with the current date. Use Leading Zeros just means that August will be represented as 08 instead of 8. I recommend turning this on for a more consistent file length. Open Keyboard Maestro and create a new Macro (CMD+n). Set the trigger to This hot key:. Next you will need to click on the field below to record your new keyboard shortcut, personally I chose: Control+Shift+Command+R. Make sure Is pressed reads after the shortcut. Next click to add a new action and search for Execute an Automator Workflow. Drag that action to the pane on the right to add it. Click the button with the ellipses on it (the three dots) and select the workflow that you just saved in step 4. You are now done. With a file selected you should be able to press your keyboard shortcut and have the date appended to it. Final macro in Keyboard Maestro. Note: Pressing the shortcut more than once on any file will keep appending the date, be careful. Add another copy of Rename Finder Items, again selecting Don’t Add when prompted. Change the format from the date, to the the time and adjust settings to your liking. This will now append the date first, followed by the time, and then the file extension. If you want the two reversed, simply drag the Time action above the Date action. The nice part is that we don’t need to change anything in Keyboard Maestro and can keep playing with tweaks until we find the mix that is right for our intended use.